In cooperation with the International Atomic Energy Agency (IAEA), the Czech Radioactive Waste Repository Authority (SÚRAO) recently organised a 4-day technical visit to the Czech Republic for nuclear waste stakeholders from Romania. The event was attended by experts from the Romanian state organisation The Nuclear Agency for Radioactive Waste (which fulfils a similar function to that of SÚRAO as well as representatives from the Romanian site selected for the location of a repository for low- and intermediate-level nuclear waste. As part of the expert programme, the Romanian delegation was acquainted with issues surrounding radioactive waste management in the Czech Republic and visited both the Richard and Dukovany nuclear waste repositories. 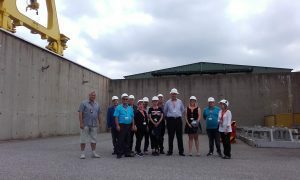 The Dukovany visit also included discussions with members of the Dukovany Civil Safety Commission and a visit to the spent nuclear fuel storage facility. The exchange of views and experience was considered to be very positive by both parties, who subsequently agreed to continue sharing knowledge in the future. The Dukovany Nuclear Power Plant Civil Safety Commission was established in 1996. The reason for the establishment of the Commission was to strengthen the level of mutual trust between local citizens and the owner of the power plant. Commission members are made up of representatives of Energoregion 2020, Ekoregion 5 and the Dukovany and Rouchovany municipal councils, and the Commission team is complemented by specialists from the Dukovany power plant. In September 2016 the Commission was expanded to include a representative from the Radioactive Waste Repository Authority (SÚRAO) which owns and operates the radioactive waste repository located within the Dukovany power plant complex.